How is everyone doing on their new year’s resolutions? Are you still going strong or starting to falter? I’ve had a few weak moments where I succumbed to my cravings, but for the most part I’ve been doing ok. I’m ready to rid myself of these pesky 15 lbs. The last bit seems SO hard to lose. Ugh. Eating healthy isn’t hard when you add a little Nature’s Path to your routine. I adore their cereals for breakfast. They fill me up and give me energy for the day. Plus, they taste so good. My fave is the Chia Plus™ Coconut Chia Granola. I’ve been buying a box every week. If you’re looking for some recipe inspiration, you need to check out Nature’s Path new Healthy Recipes & Lifestyle Tips Ebook. I can’t wait to try the Que Pasa Tortilla Soup. This smoothie bowl recipe looks decadent! Now this is my kinda breakfast. 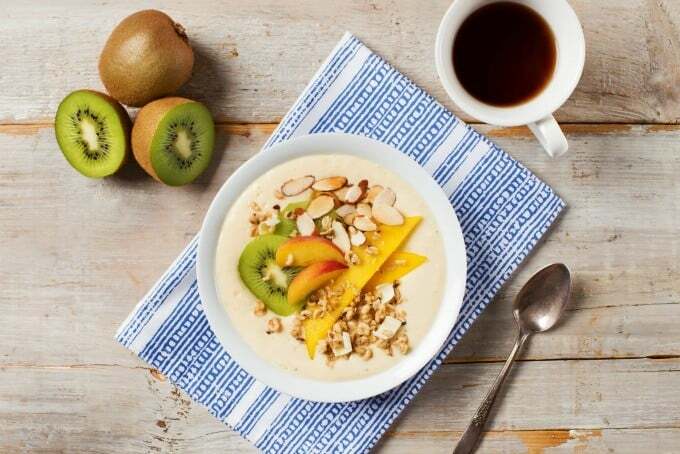 Tropical flavours mixed with crunchy coconut and chia granola bring instant sunshine to your morning routine. Find this recipe and more in Nature’s Path 7 Days of Healthy Recipes & Lifestyle Tips Ebook! 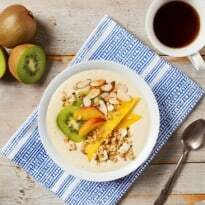 Divide yogurt mixture among 4 bowls and top with granola, kiwi, peaches, mango and almonds as desired. Disclosure: I received samples from Nature’s Path. All opinions are my own. I would love to try the Macaroon Crunch Bar. My favorite is the pumpkin flax granola cereal. I eat it every morning. I’d like to try the Macaroon Crunch! I would love to try Sunrise Crunchy Vanilla Cereal. I would like to try the Apple pie crunch chia granola sound yummy and healthy. I really want to try the Chia Plus™ Coconut Chia Granola. I’m a huge fan of granola and this sounds really good. I would love to try the Chococonut Granola Bars. They look very yummy! I would like to try the Macaroon Crunch bars. I would love to try the Love Crunch® Dark Chocolate & Red Berries. I would love tp try the Sunrise Crunchy Vanilla Cereal. We would like to try the Sunrise Crunchy Maple !